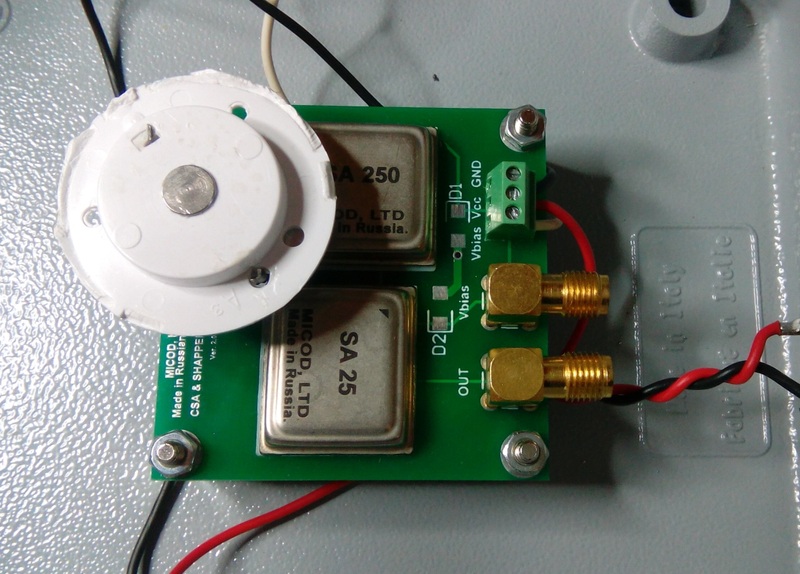 In this post we describe the applications of PIN diodes as radiation detectors. 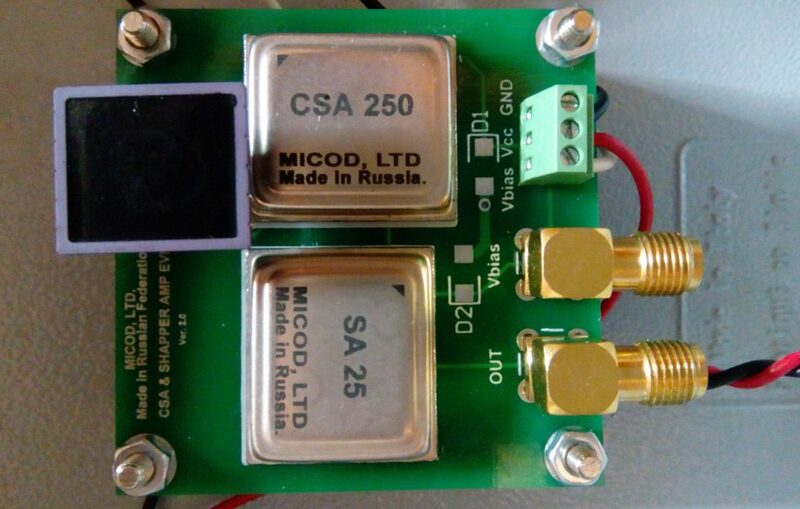 This application is well known and we have already covered this field in other posts (X Ray Spectroscopy with PIN Photodiode , Si-PIN Photodiode β Detector), now we would like to test a novel apparatus built by Micod , a Russian company, that we thank. 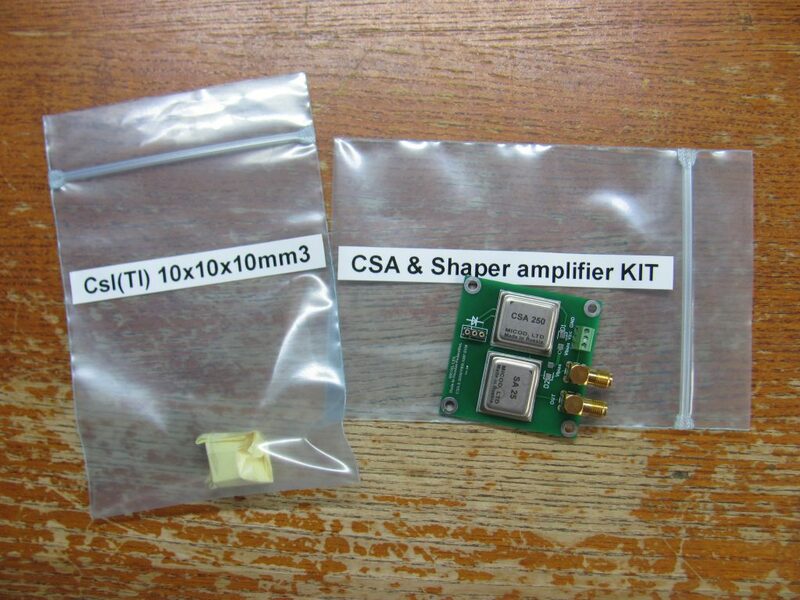 In the image below you can see the “kit” composed by a CsI(Tl) scintillator and an evaluation board with a CSA (charge sensitive amplifier) and an SA (shaping amplifier). A photodiode can be used as a radiation detector in two ways : directly or coupled with a scintillator crystal. When it is used directly it is efficient in the low-energy part of the spectrum, until 50-60 KeV. In this range it has a potentially high energy resolution. With a scintillator it can instead cover the whole gamma spectrum. In this post we describe the tests we did with a photodiode without the scintillator. A conventional Si-PIN photodiode is sketched in the figure below (from Amptek). There are two planar contacts, the anode and the cathode, with a uniform electric field between them. An X-ray interacts at some location, ionizing the Si atoms and producing electron-hole pairs. The electric field sweeps the carriers to their respective contacts, causing a transient current pulse I(t) to flow through the diode. The cathode is connected to a charge sensitive preamplifier and to pulse processing electronics, which detect the pulse and measure its amplitude. The traces at the bottom illustrate the pulse shapes at the various signal processing stages. PIN diode detectors need to be operated with enough reverse voltage in order to reach the maximum depletion zone and therefore to get the best detection efficiency. The intrinsic detection efficiency is around 100% for photons of a few keV, and decreases to around 2 % at 60 keV for a 300 μm thick PIN diode. The efficiency is around 100% for charged particles of moderate energy. The electrical characteristics that are more related with the performance of PIN diodes as radiation detectors are the leakage current and the diode capacitance. Thanks to the good quality of silicon, the leakage current can be less than 100 pA at depletion voltage and the capacitance less than 2 pF for small diodes, therefore the PIN diodes can be used at room temperature with good performance for X-ray spectroscopy, but require a low input capacitance and low noise preamplifier as read-out circuit. Due to the very small signal generated in the detector for X-rays, the noise of the measuring system has to be considered with great care in this case. The photodiode we used is the X100-7 model built by First Sensor AG. 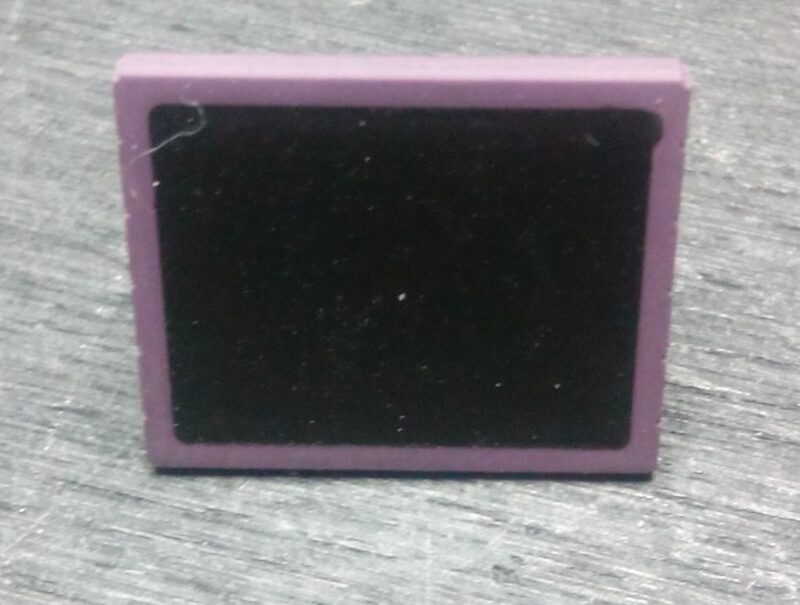 This photodiode is meant for ionizing radiation detection application (not for spectroscopy) so our aim is to test it, together with CSA-SA, mainly as radiation detector. It features a square active area of 100 mm² and a ceramic package with light blocking black epoxy encapsulant. The maximum reverse voltage is Vmax = 50 V, at this reverse biasing voltage the capacitance is Cd = 40 pF and the leakage current is Id = 5 nA. 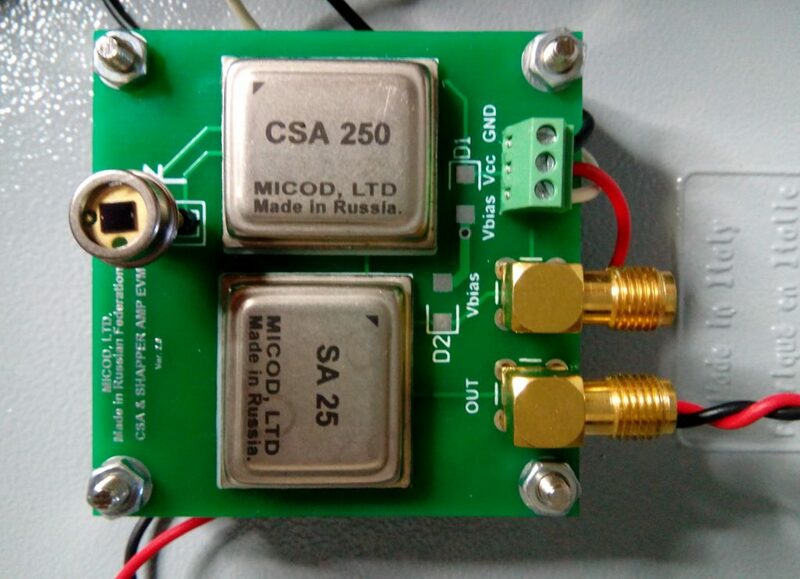 With this characteristics the diode has a good efficiency, because of the large active area, but it is not suitable for spectrometry, mainly because of the relatively high capacitance and high dark current. In the image below you can see the evaluation board with X100-t photodiode installed. The images below show some radioactive sample sources we used to test the photodiode and the amplifier. In the first image there is the Am241 source while in the second there is the Cs137 source. As you can see we put the sources in contact with the photodiode in order to maximize the counting results. In the image below you can see traces of some impulses generated by the photodiode and subsequently amplified by the CSA (charge sensitive amplifier) ​​and the SA (shaping amplifier). The pulse duration is about 10 μs, while the amplitude varies (depending on the energy of the radiation) from 200 mv to over 1000 mv. Superimposed on the signal there is a background ripple (due to the noise of the photodiode, amplified by the chain) having an amplitude of about 50 mV. With the setup described above, we did some measurement tests of some sample sources (Am241, Na22, Cs137). 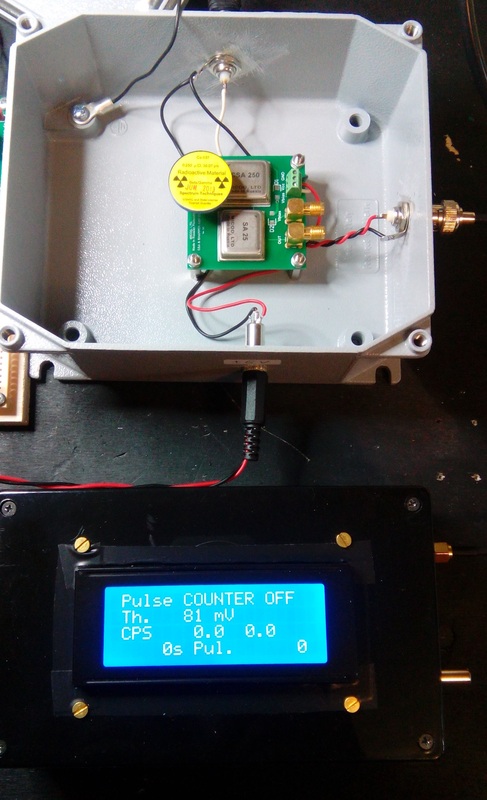 We placed the source directly on the photodiode and connected the shaper output to our pulse counter (described in the post PSoC based Pulse Counter). The counting threshold has been configured to 70 – 80 mV, so as to exclude the pulses due to noise. With the photodiode we made the measurements of the activity of the three sample sources and we compared the data with those obtained, under similar conditions, with a scintillation sensor NaI (Tl) 63×63 mm. The results are shown in the table below. In reading these data we must take into account that the photodiode is very sensitive (100% efficiency) even to the β particles, while the scintillation sensor is coated with an aluminum layer that stops them. 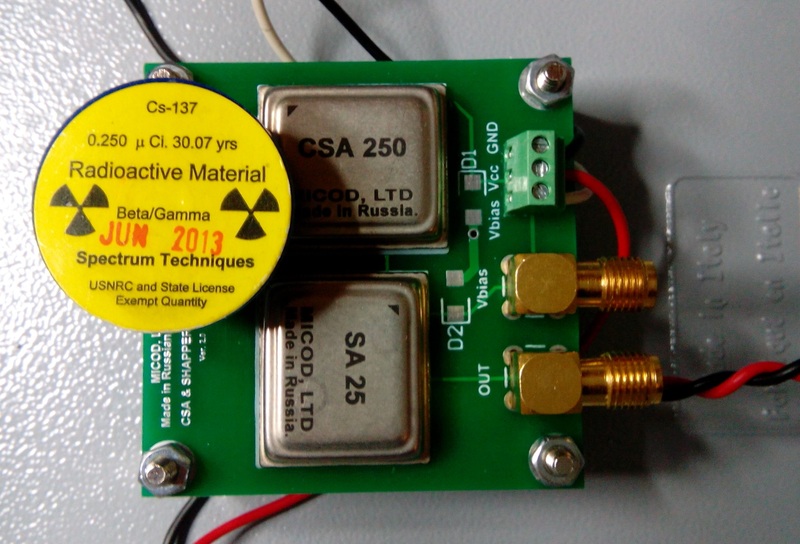 Both the source of Cesium 137 and the Sodium 22 emit, with different intensities, β particles (electrons the Cesium and positrons sodium), the photodiode countings therefore also includes a share of β radiation which is practically absent in the measurements made with the scintillator. Even taking into account the contribution of β radiation, we can see how the photodiode performance as a detector, included in the amplification chain with the pulse counter, is absolutely comparable to that obtained with a classic scintillation sensor. With the pulses produced by the shaping amplifier we tried to acquire the gamma spectra of two gamma / X sources using the Theremino MCA (DIY Gamma Spectrometry). The pulse produced by the shaping has a duration of around 15μs, rather short for the audio ADC which works better with pulses of around 100μs. In the following paragraphs are reported the results obtained that are still appreciable. 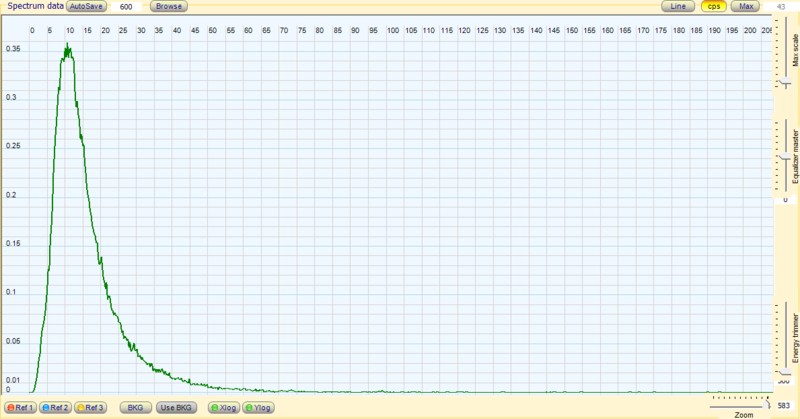 The test with the Americium 241 produced the gamma spectrum presented in the following chart. The main peak at 59KeV of the Am241 emission and the secondary peak around 15KeV due to X emissions are clearly visible. Note that the peak at 59KeV is much lower due to the reduced sensitivity of the photodiode to energies higher than 20KeV. 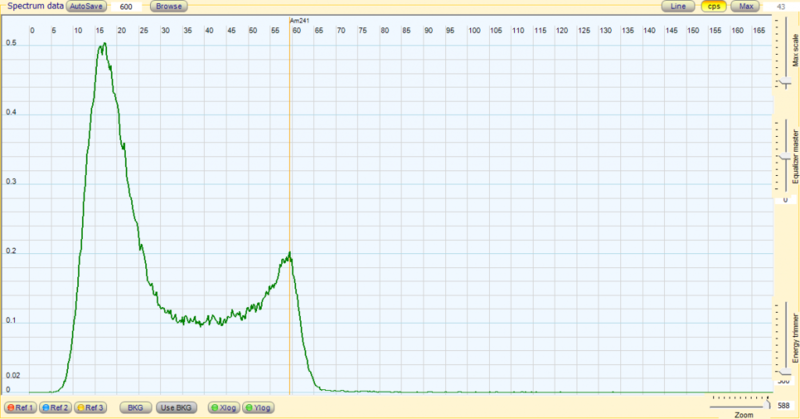 The Tritium test produced the X spectrum presented in the following graph. A capsule containing tritium emits a small amount of X- radiation at low energy, deriving from the effect of bremsstrahlung of the electrons emitted by beta decay.